Preface. List of Contributors. Historical Perspective. Control systems with a priori intentions register environmental disturbances a posteriori (W.A. Hershberger). William James, chaos theory, and conscious experience (A.R. Bailey). Systems theories: their origins, foundations, and development (A. Laszlo, S. Krippner). 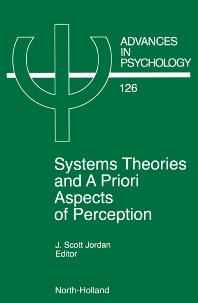 Systems-theoretical Models of Perception. Neural networks and perception (I.E. Dror, C.S. Schreiner). Broad mindedness and perceptual flexibility: lessons from dynamic ecosystems (W.A. Johnston et al.). Sensory capture and the projection of conscious perception (T.M. Cowan et al.). Systems-theoretical Models of Perception and Action. Perceiving one's own action–and what it leads to (B. Hommel). Intentionality, perception, and autocatalytic closure: a potential means of repaying psychology's conceptual debt (J.Scott Jordan). What do event-related brain potentials tell us about the organization of action: cognitive-psychological and biological approaches (B. Kotchoubey). Chaos-theoretical Models of Perception. How a priori image-schematic, simulative neuro-algorithms provide us with mental universals which parallel physical world principles (L.R. Vandervert). Visual perception at the edge of chaos (C. van Leeuwen). Phase transistions in cognition (G. Vetter, M. Stadler). Stability and instability in the dynamics of perceptual learning (J.B. Cooney). Author and subject index. This book takes as a starting point, John Dewey's article, The Reflex Arc Concept in Psychology, in which Dewey was calling for, in short, the utilisation of systems theories within psychology, theories of behaviour that capture its nature as a vastly-complex dynamic coordination of nested coordinations. This line of research was neglected as American psychology migrated towards behaviourism, where perception came to be thought of as being both a neural response to an external stimulus and a mediating neural stimulus leading to, or causing a muscular response. As such, perception becomes a question of how it is the perceiver creates neural representations of the physical world. Gestalt psychology, on the other hand, focused on perception itself, utilising the term Phenomenological Field; a term that elegantly nests perception and the organism within their respective, as well as relative, levels of organisation. With the development of servo-mechanisms during the second world war, systems theory began to take on momentum within psychology, and then in the 1970s William T Powers brought the notion of servo-control to perception in his book, Behavior: The Control of Perception. Since then, scientists have come to see nature not as linear chain of contingent cause-effect relationships, but rather, as a non linear, unpredictable nesting of self referential, emergent coordinations, best described as Chaos theory. The implications for perception are astounding, while maintaining the double-aspect nature of perception espoused by the Gestalt psychologists. In short, system theories model perception within the context of a functioning organism, so that objects of experience come to be seen as scale-dependent, psychophysically-neutral, phenomenological transformations of energy structures, the dynamics of which are the result of evolution, and therefore, a priori to the individual case. This a priori, homological unity among brain perception and world is revealed through the use of systems theories and represents the thrust of this book. All the authors are applying some sort of systems theory to the psychology of perception. However, unlike Dewey we have close to a century of technology we can bring to bear upon the issue. This book should be seen as a collection of such efforts. For psychologists, vision researchers and theorists.